Today's photos are from what just might be our most favorite post of 2015. They were taken on Christmas Day, ok Christmas evening really, after a VERY complicated assembly of Waffles' Christmas Present. WAFFLES: COOL!!! 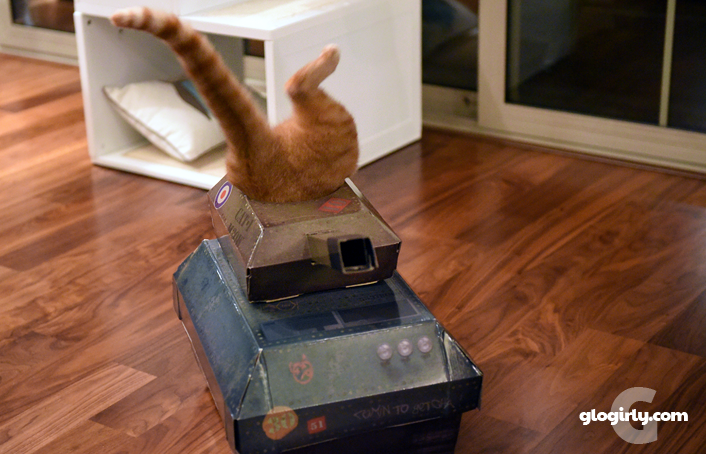 My very own cat tank! Just like the REAL MARINES have! KATIE: Waffles, do you even know how to drive that thing? WAFFLES: DUH! It's just like riding a bike, Boss. KATIE: Waffles, you don't even have a bike. WAFFLES: Yeah but if I did I'd totally know how to drive one. WAFFLES: 3, 2, 1 – EJECT! 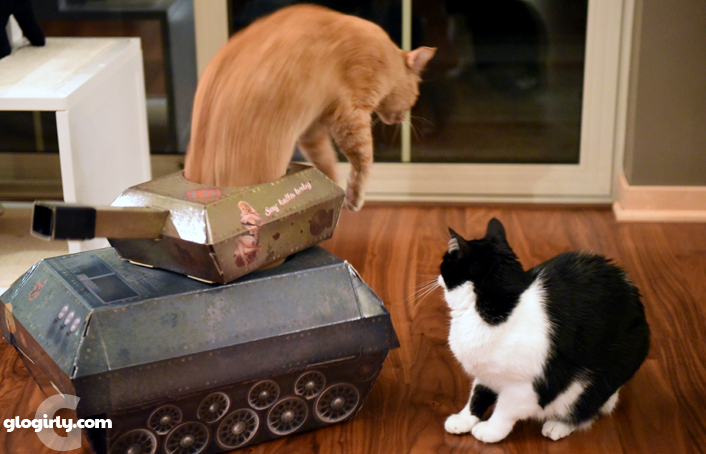 KATIE: Waffles, why don't you go eject somewhere else? 15 minutes later, Waffles waits for Katie to stroll by so he can 3, 2, 1, Eject again. Did the tank make it to Colorado? Hahaha we love this post. 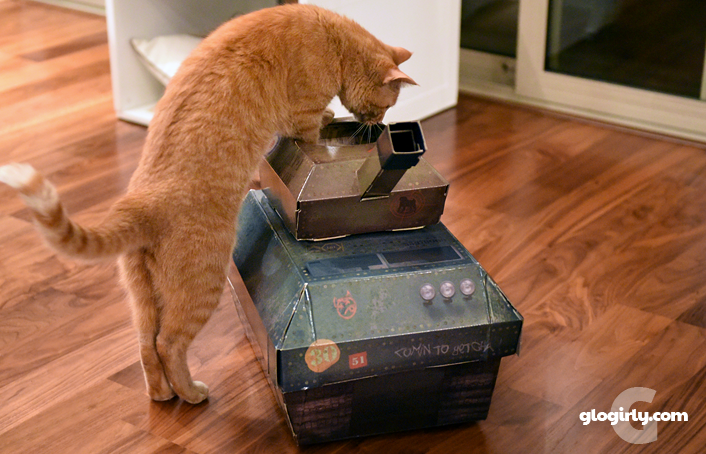 We love this post too and hope the tank made it to your new home. 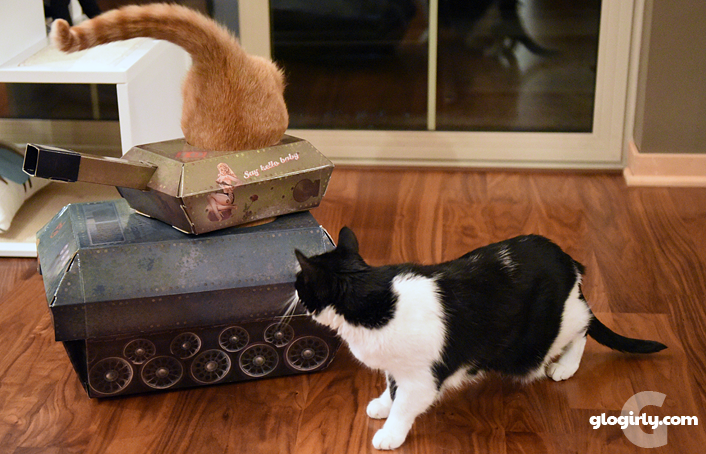 We're wondering how long the tank lasted? Very amazing and humorous photos. 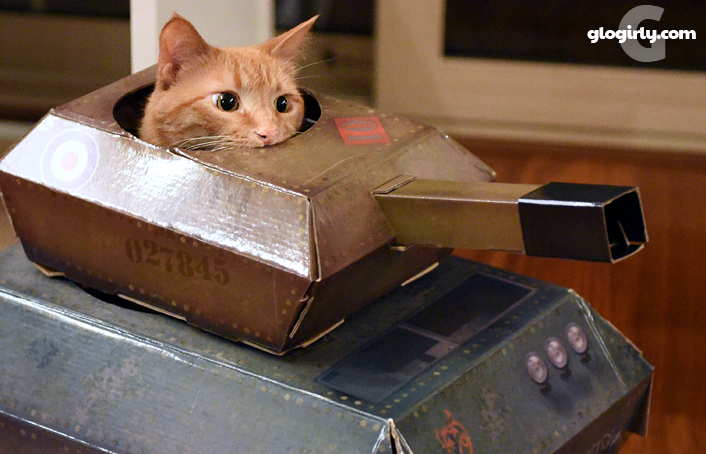 Never seen anything like that, but I can't say that I was really looking for a cat tank. "Tom and Jerry" might have used one. Oh, that Waffles is a real card! I remember that post. 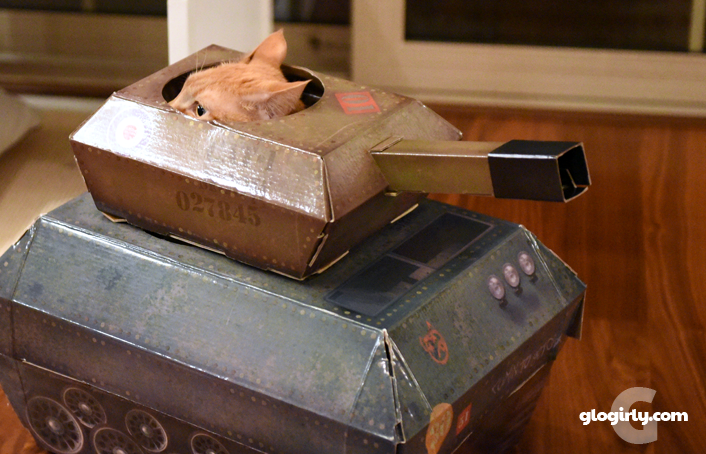 Love the tank! So cute! Did Katie ever get a turn inside? I see why this was one of the favorites. Waffles' bum sticking out cracked me up, and him peeking out with Wild Eyes is Just The Best. 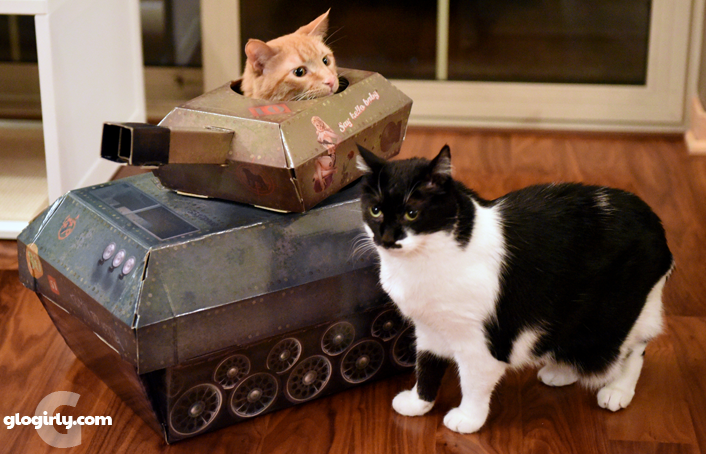 There's always a good time about to happen when there's a wild-eyed cat looking about for a target. I remember this post and still love the photo of Waffles diving in. Waffles! You rascal. And Katie...hope he didn't get to ambush you from the tank! Waffles is the most hilarious boy! Katie is surely entertained!